Brett Westwood presents a practical, informative and entertaining guide to help you identify the birds in your garden at this time of year. Brett Westwood is joined by naturalist Phil Gates in this informative and entertaining guide to some of our common garden wildlife. Recorded near Bristol, each programme focuses on a different garden habitat; log piles, ponds, hedgerows, trees and shrubs and finally stones. The series offers helpful advice on the appearance, behaviour and sounds of some of the typical species you’re likely to find, their value in the garden, and how to encourage them into your own garden. On 6 May David Attenborough will launch Tweet Of The Day, Radio 4’s new year-long celebration of the wonder and poetry of birdsong. Just before the Today programme, early risers will be treated to a different call or song of a British species, followed by a fascinating story of ornithology specific to the tweet in question. 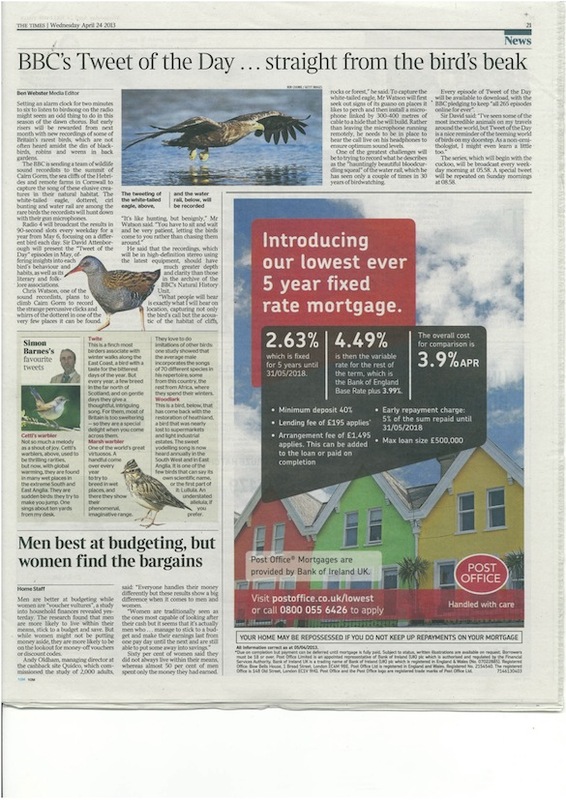 In Britain there are now 596 species on the official bird list, of which 286 are recorded as rare. The BBC will be collaborating with brilliant wildlife sound recordists such as Chris Watson, Geoff Sample and Gary Moore to track down the songs of some of these much-loved birds, from the nightingale to the swift, the greenfinch to the garden warbler. The series will begin with the cuckoo – the song of the male is familiar to many, but how many of us can say that we have seen the bird itself? “I suppose for me listening is the most important thing I can do,” says acoustic biologist Katy Payne in this series. “ I just wish we were as good listeners as elephants are”. In this two-part series, we discover that listening is about much more than just hearing.as we meet individuals whose professional lives are spent listening and interpreting the sounds they hear. The first programme focuses on sounds within the human hearing range and the second programme, explores ultrasound and infrasound; sounds above and below the human hearing range. In the second programme we hear from acoustic biologist Katy Payne, Brian Baptie, a seismologist with the British Geological Survey, astrophysicist Tim O’Brien, wildlife sound recordist Chris Watson and bat ecologist John Altringham. Which bird sounds like a coffee percolator and moves like a clockwork mouse? Well, the answer can be found in the first of a new series of Radio Guides to our commonest upland birds. Surrounded by the go-back-back-back calls of Red Grouse, Brett Westwood joins keen bird watcher Stephen Moss on the magnificent rolling hills of the Long Mynd in Shropshire. With the help of recordings by wildlife sound recordist Chris Watson, they offer a practical and entertaining guide to the birds which you’re most likely to see and hear on heather moors in Upland Britain. This series complements five previous series; A Guide to Garden Birds, A Guide Woodland Birds, A Guide to Water Birds, A Guide to Coastal Birds and A Guide to Farmland Birds and is aimed at both the complete novice as well as those who are eager to learn more about our upland visitors and residents. Recorded high up in the Shropshire hills of the Welsh Marches, and inspired by a living landscape and its history, Chapel of Skins is a fictional story about a ghostly meeting of ways, written and narrated by Paul Evans with wildlife sound recordings by Chris Watson. Cellist Beatrice Harrison duets with nightingales in a Surrey garden – or does she? Sound recordist Chris Watson investigates. Hy-Brasil is a phantom island which features in many Irish myths. It appears on a map in 1325 off the south west coast of Ireland and said be cloaked in mist except for one day every seven years, when it becomes visible but still cannot be reached. There are rumours of strange creatures and a lone magician who inhabit it. 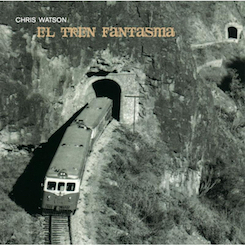 Written and narrated by Paul Evans, with sound recordings by Chris Watson, Hy-Brasil tells the story of a journey across a sea of imagination in search of this phantom isle. An unusual cabaret of sound inspired by the songs of crickets. Created from field recordings of the insects, electronically treated sounds (by Chris Watson) as well as music and human voices, Cricket Cabaret is a celebration of the songs of crickets; a quirky, sound-rich composition inspired by ancient traditions. The Estonian-based Framework FM project (Patrick McGinley) will broadcast this selection of field recordings made by students from the School of Art, Architecture and Design at Leeds Metropolitan University over the past three years working with Alan Dunn and the sound recordist Chris Watson. Each year a group of students work with Chris around Leeds, building their own contact microphones, experimenting with hydrophones or working with bat detectors to create unique new audio portraits of Leeds at various times of the day. In this selection we hear numerous original recordings and edited compositions ranging from the sound of inside a pinball machine, night-time acoustics under the rail bridge by the Leeds & Liverpool Canal and the microscopic sounds of maggots. A drawing scratched onto a wall comes to life as writer and naturalist Paul Evans reflects on the significance of The Cave Horse. 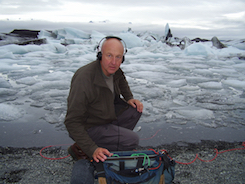 Illustrated with recordings made on location, wildlife sound recordist Chris Watson recalls his experiences in two dramatically different cave systems: the limestone caves of Waitomo in New Zealand, and the Kverkfjöll ice caves in Iceland. Alan Read, Professor of Theatre at Kings College London takes a philosophical approach when he reflects on Plato’s Cave. Martin Palmer, Secretary General of The Alliance of Religions and Conservation reflects on the role of caves in religious stories and traditions. A dramatic finale to this series ventures inside the human cave; the mouth, in a virtual journey around the senses. Written by Patricia Reynolds specialist in oral surgery and Director of Flexible Learning at Kings College London. The first of three nautically themed tales by Lynn Truss, written for and performed at the BBC More than Words Festival. Haunted by the sinking of RMS Titanic one hundred years ago, this fictional soundscape tells the story of an iceberg and its journey south after calving from a glacier in Greenland. James Aldred has long dreamt of seeing the world’s biggest trees, but their location is a well-kept secret, and then James is introduced to Michael Taylor, the man who found Hyperion, the world’s tallest tree, and so begins an adventure to the Giant Redwood forests of California in search of the some of the biggest living organisms on the planet, and an incredible climbing challenge. James Aldred encounters some of the world’s biggest trees in The Grove of Titans and a childhood dream comes true when he’s not only taken to see Hyperion, the world’s tallest tree, whose location is a well-kept secret, but also gets the chance to climb it. 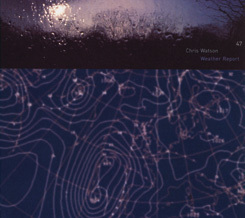 Wildlife sound recordist Chris Watson spends much of his time listening and recording the sounds of the natural world. When the National Gallery invited him to create a sound piece inspired by a painting of his choice, he chose Constable’s ‘The Cornfield’. This was the start of a creative and exciting project, which also involved students from Ravensbourne College of Art and Design and other professional musicians and sounds artists. The project began with audio guides for paintings selected by the artists, and then later developed into an evening event involving a live sound mix in the gallery to accompany a tour of the paintings with an art historian. NATURE uses these events to explore how painters use a range of techniques to excite the viewers senses; not only the visual sense, but the senses of smell, touch and perhaps most poignantly, hearing. The programme also explores how sound installations and sound guides may help some viewers, especially people who might feel intimidated by paintings, to engage with these works of art. Chris Watson leads a team of wildlife sound recordists to Corbett National Park in India, in the hope of capturing the sounds of the forest and the roar of a Bengal tiger. Drawing on extracts from her book, ‘Broadland Birds’, NATURE tells the remarkable story of Emma Turner, a pioneering bird photographer who lived for many years on a houseboat in the reed beds at Hickling Broad. It was here that she took a remarkable photograph which provided evidence that Bitterns which had been driven to extinction in Britain in the late 1800s were breeding in Norfolk once again. More than ten years ago, sound recordists Chris Watson and Thor McIntyre-Burnie recorded the sounds of tens of thousands of starlings when they came into roost for the night in the derelict remains of the concert hall on the West Pier in Brighton. Today the West Pier no longer exists, having been destroyed by storms and fire, what remains are the sounds of a Ghost Roost. Writer Paul Evans accompanies sound recordist Tom Lawrence on a journey in sound across Pollardstown Fen to hear the extraordinary sounds of an underwater orchestra of aquatic insects. Soundings from a frozen landscape: A powerful and emotional journey in sound; above, below and within Antarctica’s landscape of ice with contributions from the team who made the BBC series Frozen Planet. Sound recordist: Chris Watson, Producer Sarah Blunt. You can read a review in The Guardian of this broadcast here.